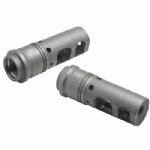 The advanced SureFire SFMB-762-5/8-24 muzzle brake, which fits the Armalite AR-10, DPMS LR308, and 7.62 mm rifles with 5/8-24 muzzle threads, greatly reduces both recoil impulse and muzzle rise and features neutral porting that loads bi-pod legs evenly. Its patented Impulse Diffusion design minimizes side blast and rear-directed concussion effects. The SFMB-762-5/8-24 also serves as a rock-solid mounting adapter for SureFire SOCOM Series 7.62 mm Fast-Attach® suppressors, the SOCOM762-RC model having recently won the Mk13 .300 Win-Mag sniper rifle contract award with the US Special Operations Command in the most extensive and rigorous suppressor testing ever conducted. Precision machined from US mill-certified heat-treated stainless steel bar stock—including high-precision single-point cut threads for optimum thread interface—the SFMB-762-5/8-24 muzzle brake is given a black Ionbond DLC coating to provide maximum protection under harsh environmental conditions and to facilitate cleaning even after extreme use. When used in conjunction with a SOCOM Series suppressor, the patent-pending design of the SFMB-762-5/8-24 provides multiple bearing surfaces to ensure superior suppressor alignment. 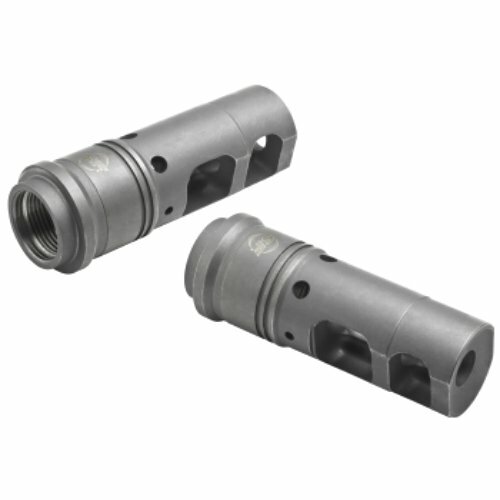 A rear labyrinth seal minimizes potential carbon buildup in the indexing system and facilitates suppressor removal after extended firing. Delivers greatly reduced recoil impulse and muzzle rise, and features neutral porting that loads bi-pod legs evenly.